So. I’ve gone on and on about curacha. I am quite certain that you do not want to hear more of the same ardent ramblings on the subject. If you missed it though, please check here and here. This is truly an awesome crustacean and worth getting to know. All that being said, allow me to tell you about another way that I used my precious curacha bounty. Crab cakes! Crab cakes are something I have had (shameful I know) only in restaurants. I have never tasted any homemade, and I have never hazarded an attempt at making them myself. Well, a surfeit of sweet curacha meat has finally presented me with the golden opportunity, so I put my hands together, got on the trusty internet, and started looking for recipes. 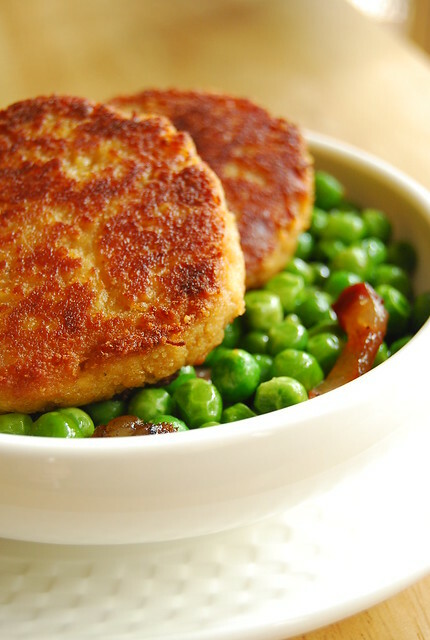 When I found these Traditional Maryland Crabcakes on Jen’s Use Real Butter I was sold. It seemed simple enough for a beginner like me, and (and that’s a very emphatic “and”) it includes Old Bay seasoning. Old Bay is traditionally used in seafood boils/bakes all over America (or in the places that they have seafood boils/bakes, I’m not the expert) and, as such, not a part of my growing up at all. Hence, exotic and wildly attractive to my Eastern taste buds. I wasted no time in having some bought (when my mother was in New York) and I have been admiring the very dignified looking tin sitting stodgily in my pantry ever since. – In a bowl, mix the egg, mayonnaise, Old Bay, Worcestershire, paprika, and cayenne if using. Stir together until everything is incorporated. – Add the curacha/crab meat and mix well. – Stir in the bread crumbs. If the mixture looks too wet, you can add a little more crumbs just so that it holds together. It will be a fairly moist, but workable. – Form into patties. Coat the patties in the cracker crumbs (I use Sunflower crackers, cheese flavor). – Heat oil in a skillet. You want the oil to evenly coat the bottom of the skillet. When the oil is hot place the patties in the pan and fry until the bottom is golden brown. Flip and brown the other side until cooked through. All in all about 8-10 minutes work. Makes 4-5 patties. I served them here with and absolute favorite of mine, peas and pancetta, or, if my wallet protests, peas and bacon. My love for this dish is tremendous, and I will be sure to share some version of it, someday, on this blog. Today, however, is for curacha, crabcakes, and Old Bay. I know if I say, at this point, that Old Bay and crabs go together like chocolate and hazelnut I would be 70 years late in the game. But better late than never right? I believe so! I’m starting to feel a clam bake or shrimp boil coming on! Unchartered territory, but I am bolstered by the success of these crabcakes. It is never too late to try something new, and don’t let being a newbie (or the fear of sounding like one) stop you from being as brightly enthusiastic as you wish. Cynics may sneer, but there are people (like me!) who will love you for it and invite you to all their parties! Happy weekend! Those look very scrumptious! I really love that mix of ingredients and the crispiness of the cakes. Old Bay! Shades of my growing up especially while day was stationed along the Gulf coast. That is a gorgeous crustacean on those peas! Oh my! This looks and sounds really good! still don't know what curacha is, but serve me some! These look absolutely mouth-watering. Thanks for posting! Hi Ling! Hahaha! You are too funny! Hi Paz! Thanks! We really enjoyed it! Hi Lula! It's a type of crab found in the southern parts of the Philippines 🙂 And it's delicious! Yum! The crab meat is pre-cooked, right? Looks so delicious. Those curacha cakes look PERFECT!:-). Well, I'll tell you a secret… I've never made crabcakes myself at home either.. O shock.. 🙂 I do think your curacha cakes look delicious! your crab cakes look so perfect! Hi Shalum! Yes, the crab meat is pre-cooked 🙂 My father-in-law steams the curacha then freezes it before flying it to us. whoa, never thought about curacha this way! these definitely look yummy! These would be perfect for a lunch sandwich with lettuce and cucumber salad on ciabatta! So summery! oh yum yum! your blog is truly delicious!! and i love the looks of these little cakes!! wow, these crabcakes look awesome! was always curious about Old Bay. Great photo! Oh word? Someone is making crab cakes who has actually heard of Old Bay?! Awesome!